Spread cream cheese into a 10 inch circle on plate. Top with a thin layer of cocktail sauce. Sprinkle shredded cheese on top of sauce. 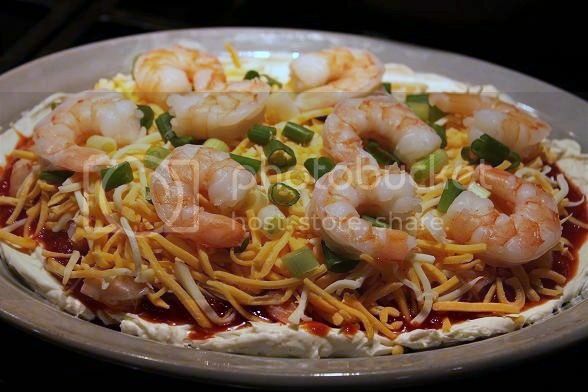 Place shrimp on top of cheese. Add a little more cocktail sauce on top of shrimp, if desired. Sprinkle green onions on top. Place Ritz or a fancier type cracker in circle around dip on plate before serving. That looks very good - I'm looking for something different for Christmas appys and this looks like something I'd like. I also have a bowl that looks exactly like that - ironstone make in GB.